I once held a secret for five years. During that five years, I became very depressed. I finally told someone the “horrible” secret and suddenly the world got brighter and the dark cloud hanging over me began to shrink. 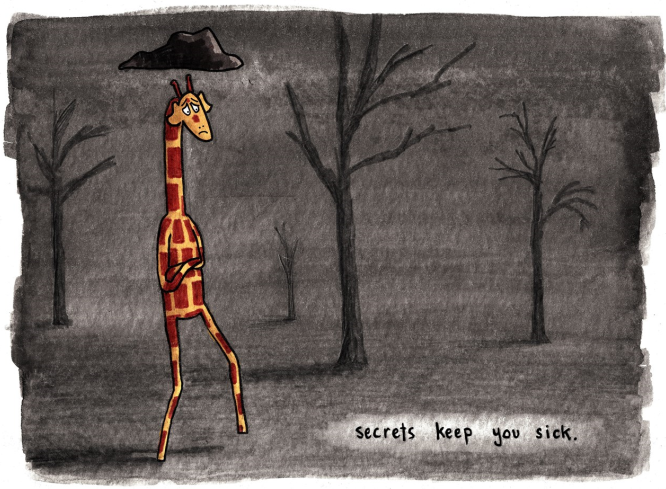 Yes, secrets make you sick. Depends on the secret and whether it is your secret or someone else’s… but the bad ones do make you sick. The good, or at least not bad, ones are still a burden… even if they aren’t harmful secrets, it’s a toll on you to have to keep one for a while. Un-secreting is why I blog. You always have a knack for drawing JUST the right topic for myself. Always relevant. Thank you. So happy you followed my blog, I might never have met your wise little giraffes otherwise. This guy has it figured out… it was totally what I needed to see today.